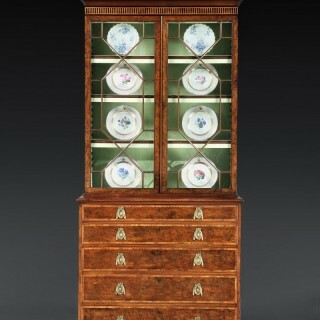 A very fine George III burr yew, mahogany, and engraved marquetry bureau cabinet. The broken arched cresting surmounted by a later urn finial, inlaid with feathered husks and a patera above a dentilled and faux-fluted frieze, with a pair of astragal-glazed doors with watered silk-lined interior, the base with kingwood crossbanding, secretaire-drawer enclosing a fitted interior above three graduated drawers, on later bracket feet, fitted for electricity. This secretaire-bookcase can be confidently attributed to the pre-eminent cabinet-makers William Mayhew and John Ince. Most significantly, the use of yewwood with ebonized details as featured within the trompe l’oeil flutes of the frieze as well as the display of shaded and engraved marquetry are signature characteristics of their oeuvre. Paterae wheel medallions are found on a pair of serpentine commodes almost certainly supplied by the firm to the 2nd Viscount Palmerston for Broadlands, Hampshire (H. Roberts, ‘Furniture at Broadlands -II,’ Country Life, 5 February 1981, p. 347, fig. 3). A similarly fluted frieze features on a satinwood and marquetry breakfront attributed to the firm and sold ’50 Years of Collecting: The Decorative Arts of Georgian England,’ Christie’s, London, 14 May 2003, lot 40, as well as on the Monson commode (lot 90 in this collection). A pair of mahogany bookcases by Mayhew and Ince with carved fluted friezes was purchased by the Her Majesty Queen Elizabeth, the Queen Mother for Clarence House from Olantigh, Kent. One of these appears in a photograph of the refurbished Lancaster Room, M. Hogg, ‘Clarence House,’ The World of Interiors, October 2003, p. 199.